(1) No one was doing patatas bravas, shishito peppers, bikini sandwiches, pintxos morunos, or romesco sauce before Tia Pol. Tia Pol opened in July 2004. Patatas Bravas? If nowhere else, they were on the menu at Casa Mono when it opened in December 2003, as mentioned in this NY Times write-up, though there are also mentions from at least a year earlier. Romesco? It could be found on menus in frumpy Long Island way back in 1995 (with several mentions in reviews thereafter). Pintxos morunos? Again it would be Long Island, the culinary trendsetter, where you could find it back in 1984. And a bikini sandwich is basically just a grilled cheese with ham and a cool name. Can I stop yet? But more importantly: even if you were right, just how much pride of authorship can you claim (or stated another way, how much resentment can you legitimately harbor) for simply being the first person to co-opt a traditional dish from another food culture? So you were the first one to "steal" it? Congratulations. (2) Toro "straight-up took" the uni panini from Chef Raij, and it's "one of the few original things" she's created. The origin story of the uni panini, curiously enough, has already been the subject of a "goes around ... comes around" post here. And while Chef Raij now appears to claim the dish as her own unique creation, like Athena spouting forth from the forehead of Zeus, the contemporaneous accounts (linked to in the earlier post) suggest that it was in fact a collaborative effort with none other than one of the chefs Chef Raij now calls out: Michelle Bernstein. But more importantly: you invented sea urchin on bread? Surely the Italians have been eating that since there's been bread and sea urchins. And it's pretty easy to find earlier iterations than the one El Quinto Pino started serving in 2007-2008, including the sea urchin crostini at Cliff's Edge in Los Angeles mentioned in this 2004 review. Something can't be "taken" from you if it doesn't belong to you. And while no dish truly "belongs" to any chef (there is no copyright or trademark protection for dishes or recipes), the claim is particularly silly here. If anything, El Quinto Pino got recognition for the uni panini as a "signature dish," and yes, other restaurants copied it. Take it as a compliment. And get over it. (3) "Michelle Bernstein took that Bar Mut dish and then got called a creative genius by Frank Bruni." Well, actually, guilty as charged. Kind of. The "egg yolk carpaccio" at Michelle Bernstein's Sra. Martinez is a great dish - a plate glossed with a layer of just-warmed egg yolk, topped with crispy fried potato shreds and tender shrimp. It's also a straight take-off of a dish served at a little Barcelona tapas bar called Bar Mut. But you know why I knew about Bar Mut? Because Chef Bernstein told me about it! Chef Bernstein is pretty open in talking about the things that influence her cooking, which include dishes she's had at other restaurants. The same is true of pretty much every other chef in the world, whether they admit it or not. 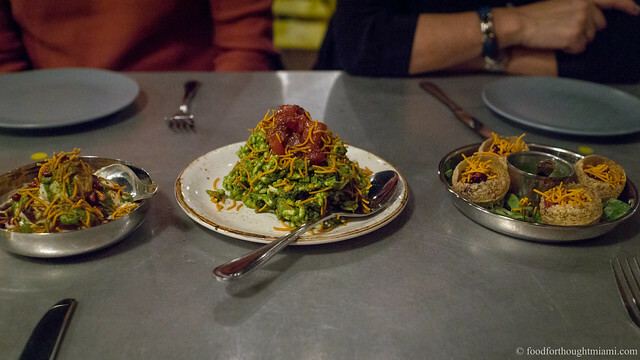 What Raij is referring to is not what Michelle herself ever said about the dish, but rather what former NY Times food critic Frank Bruni had to say about it. It was Bruni - not Bernstein - who described the dish as one that " [sprung] from Ms. Bernstein's fertile imagination." And it wouldn't remotely be the first time Bruni had no clue what he was talking about, particularly when it comes to who did what first. Just a couple examples I've noticed: in 2009 he proclaimed Houston's Feast an offal-centric restaurant with no peer anywhere else in the U.S., which surely had Chris Cosentino of San Francisco's Incanto scratching his head; more recently, he praised Torrisi's "culinary brainstorming" of dishes such as scungilli treated as escargot (something Bernstein was doing years ago at Michy's when it opened in 2006) and pork braised in Manischewitz (somethng Ilan Hall was doing years ago at The Gorbals). As a writer, Bruni suffers from a syndrome I've seen before: he often seems to believe that nothing existed in the universe before he deemed it worthy of interest. That's the fault of the author, not the chef. (4) "When we borrow something, we give credit and name the restaurants we love in the menu." Let's see. Here's the menu from La Vara. There are thirty dishes listed. Here's the menu from Txikito. There are 35 dishes listed. Here's El Quinto Pino's menu. Another 25+. How many other chefs or restaurants are listed in the menu? Exactly two: Sevilla's El Rinconcillo, and Madrid's Casa Lucio. So I guess Chef Raij invented some 88 other dishes. Very impressive. Here's the simple truth: Menus rarely come with footnotes and bibliographies. EVERYONE "borrows." EVERYONE copies. Chefs who complain about others doing it rarely have a legitimate beef, and more often come off as back-biting whiners. Curiously, the folks referenced in that first post from a few years ago - chefs Michael Schwartz, Jon Shook and Vinny Dotolo - all cooked together for an excellent dinner recently. Though as someone who loves both footnotes and retracing culinary influences, that would be awesome if they did. Alcala, on the UWS from the late 80's till ?, had some of the best tapas in NYC. This was before tapas became too popular. First time I've ever seen Alcala mentioned anywhere since it closed (I think in the early nineties). It did put out great tapas, and all sorts of stuff nobody else was doing. I know because I worked in the kitchen. We'd roast a whole pig each night, and make amazing paellas, shrimp dishes, etc. Thanks for reminding me -- it really was ahead of its time. Man, it would be hard to be married Chef Raij. Even if you get inspired by a dish you have to successfully execute it. Did Chef Goldsmith invent the Pop Tart? No, but she improved upon it and made it her own. I can understand getting upset when someone rips off an entire restaurant concept (BurgerFi = Shake Shack, HiWay Burger = In N Out).